A couple of years ago, I had the great fortune to tour the Tuscan countryside with one of my favourite clients; DaVinci Wine. One of the highlights in a trip that was absolutely packed with great food was the Bresaola Parmesan Salad served in one of our meals. It was pretty; but all of the food we saw was lovely. To be honest, when I looked at it, I was underwhelmed. 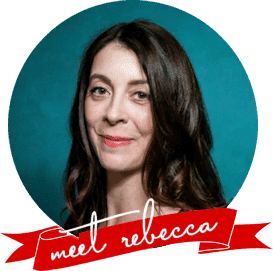 I saw cured beef around the perimeter of the dish, a generous helping of arugula, some Parmesan curls, a drizzle of olive oil and balsamic vinegar, and a scattering of cracked black pepper and coarse sea salt. I figured they had spent the bulk of their effort on the rest of the meal and this salad -while I was sure it would be fine-, had been composed just to fill the role of salad in the meal. One bite of the Bresaola Salad and I understood that it was the embodiment of what I saw as the true Italian approach to cooking; take excellent ingredients, combine them wisely, do as little to them as possible, and be rewarded with true food bliss. You may already know that Bresaola is one of the few Italian salami that is made with beef. While pork usually reigns supreme in the Italian cured meat department, Bresaola is a real stand out both visually and flavour-wise. It has a distinctive deep-red, almost purple colour, is salty, lean, and aged for a few months. If beef jerky had a refined cousin, Bresaola would be it. It manages to be both concentrated in beefiness and tremendously subtle. When you’re looking to buy Bresaola, don’t get frustrated if it is a little harder to find. Many American deli counters that sell charcuterie and salumi market Bresaola as Mocetta or Mocetta Bresaola. The Creminelli brand, for instance, is one that markets it as Mocetta. If you live near a Wegman’s, I know their deli departments sell it as Bresaola. Don’t have a fainting spell when you look at the price per pound when you find it! I know the price tag is WHOA, but a little Bresaola goes a long way, and it doesn’t take more than 1/4 pound to make a Bresaola Parmesan Salad fit for a couple of hungry adults as a main dish or several teens as a side dish. Don’t let the simple presentation and short ingredient list fool you. 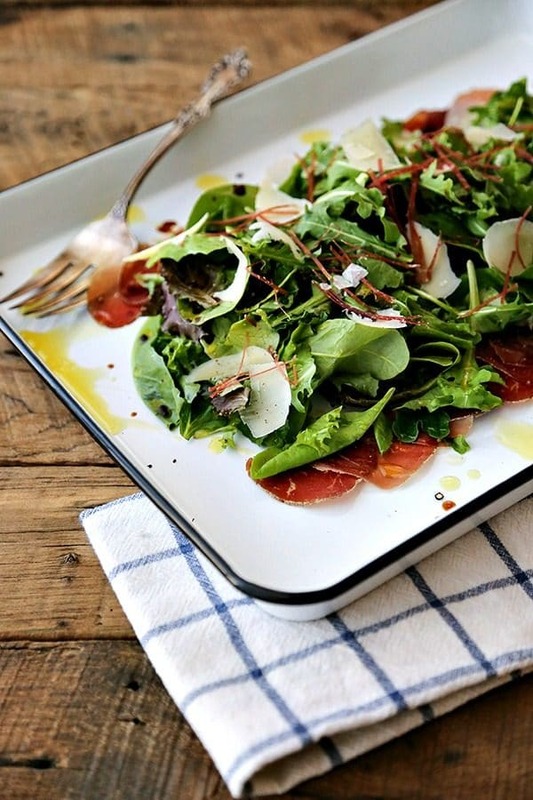 This Bresaola Parmesan Salad will knock your socks off in a very good way. I am betting that it will become a regular in your summer foods rotation this year like it has been for my husband and me! Wegman’s helpfully offers Bresaola pre-sliced in packages suitable for making two dinner sized Bresaola Parmesan Salads. If your store has it whole in the deli, charcuterie, or salumi section, just order it sliced paper thin. For one salad, order 20 slices. Don’t worry. This really isn’t much, weight wise! I’ve given instructions here for a large dinner salad served family style. You can absolutely plate this in individual servings if you prefer. Simply divide between your desired number of plates. 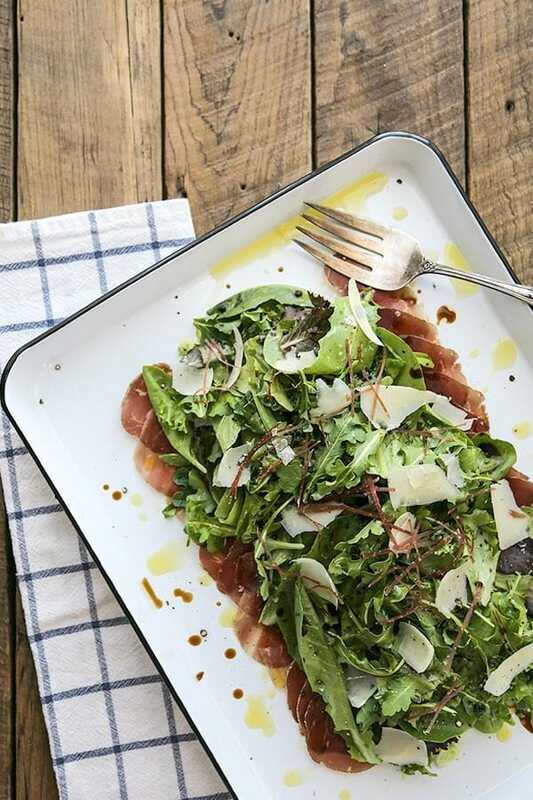 Because there are so few ingredients here, using premium extra virgin olive oil and balsamic can really make your Bresaola Parmesan Salad spectacular. If your budget allows, go for a first cold press, unfiltered extra virgin olive oil and an aged balsamic vinegar. I recommend using a block of Parmesan cheese and shaving off of the block with a vegetable peeler. This gives you paper thin slices of Parmesan to scatter around the salad. A second choice would be grating it directly from the block with a microplane. I don’t think this Bresaola Parmesan Salad would be nearly as good with pre-grated or powdered Parmesan. 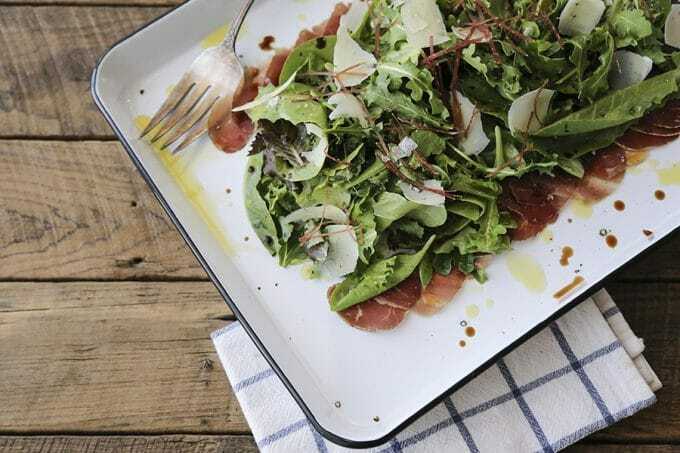 Arugula is my green of choice for this cured beef and parmesan cheese salad because the peppery bite stands up beautifully to the other strong flavours. If you’re averse to arugula, you can substitute in cress, mixed spring greens, or baby spinach for it. 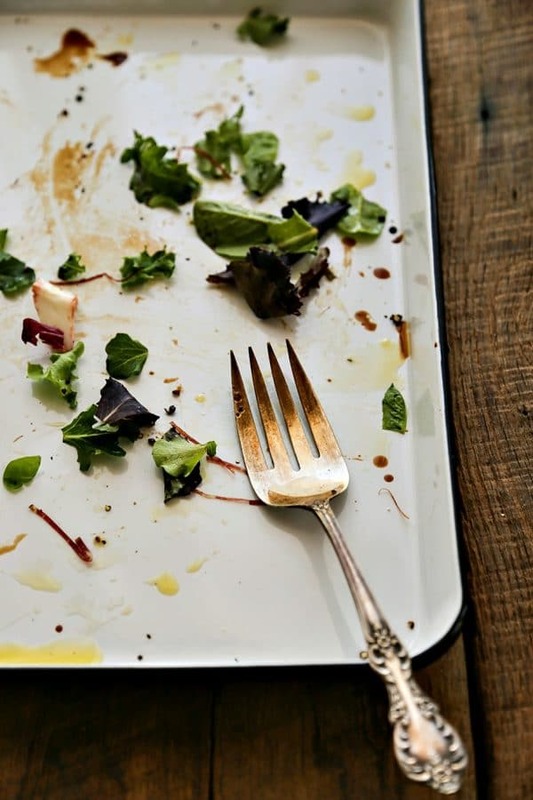 Don’t glug the olive oil and balsamic over your salad! This is a case where less is more and you can build up to a larger amount at the table. To keep control over the flow of oil and vinegar over my Bresaola Parmesan Salad, I block most of the opening to the bottle with my thumb and drizzle droplets over the salad until I’m happy with it. I am not looking to wet the salad, just lend it some of the excellent flavour from extra virgin olive oil and balsamic vinegar, so it doesn’t take much! Bonus: after doing this, you get to lick the olive oil and balsamic from your thumb. No? That’s just me? I promise I wash my hands before touching anything else! This is a job for a pepper grinder, friends. I like my pepper super coarse over this salad, but you can go a little finer if you prefer it that way. That said, it really is best by a mile when made with freshly ground pepper. By the way, I adore my pepper grinder and it’s been going strong for over five years. Maybe closer to a decade? It’s infinitely adjustable from super fine grind to mega coarse, barely dented pepper. Likewise, I prefer a pretty coarse sea salt for our salad; maldon sea salt flakes, specifically. 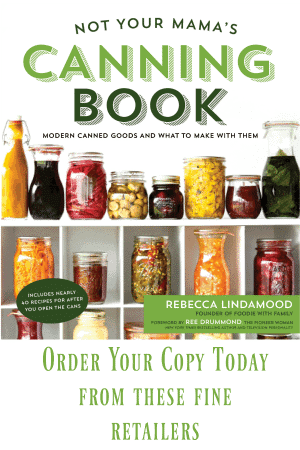 You can buy them at most well-stocked grocery stores (HEY WEGMAN’S! I see you!) or on Amazon.com. 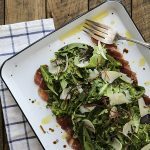 If you love Bresaola Parmesan Salad, you might like these salads, too! 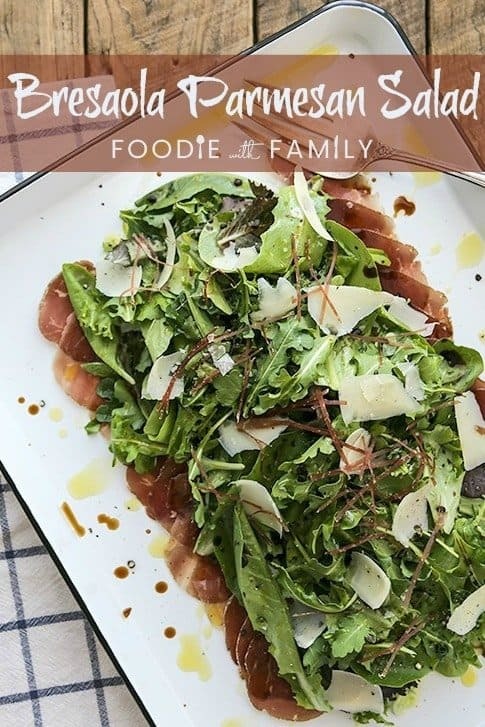 Bresaola Parmesan Salad; arugula, cured beef, + Parmesan, a drizzle of olive oil + balsamic vinegar, cracked black pepper + coarse sea salt. Simple and divine! Arrange 16 of the bresaola slices overlapping slightly around the perimeter of the serving plate. Mound the arugula in the center of the plate, spilling onto the bresaola. Drizzle the balsamic vinegar and extra virgin olive oil over the salad, then top with the shaved parmesan cheese, cracked black pepper, and coarse sea salt. Take the remaining slices of bresaola and roll them into a tight cylinder. Use a chef's knife to cut the cylinder into slices that are as thin as you can make them. Use your fingers to separate the ribbons of bresaola and scatter over the salad. This sounded so good, but I was nervous about making it as it was so different from our usual salad entree. Finally, I bit the bullet, put it in the menu plan, and got the arugula and meat to make it. (I already had the other ingredients.) I couldn’t find the suggested meat, so I just used Italian salami that comes in an antipasto pack at Costco. It was FABULOUS. We all loved it including hubby that only eats salad drowning in thousand island dressing. Thanks for expanding our salad repertoire. Excellent! Truly like you are served in Tuscany! Thank you, Colleen!! I’m so glad you liked it and it “took you” to Tuscany! !